Once every few months, or so, I get in the mood to cook. My most recent bout of "I must cook something I wouldn't normally cook or eat" was a berry crisp. I originally saw a recipe on Pinterest that looked delectable, but after finding that it was gluten free, I hunted around for something similar that contained all of the delicious gluten possible. I think I'm allergic to gluten-free... 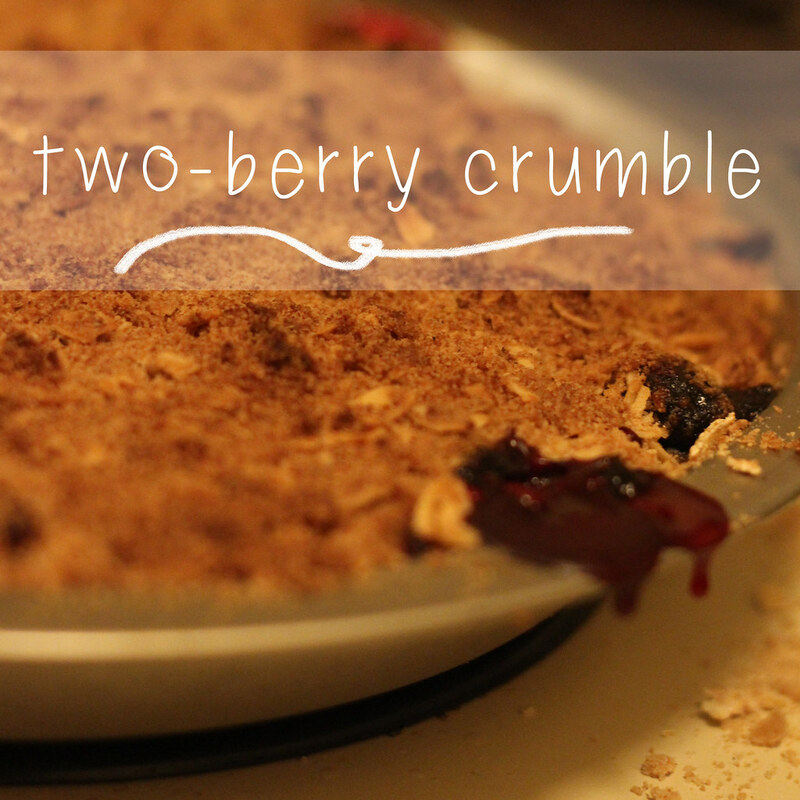 I settled on a recipe for a "Best Berry Crumble" linked below that seemed to fit all of my criteria for baking - simple ingredients, easy, less than one hour prep + cook time. 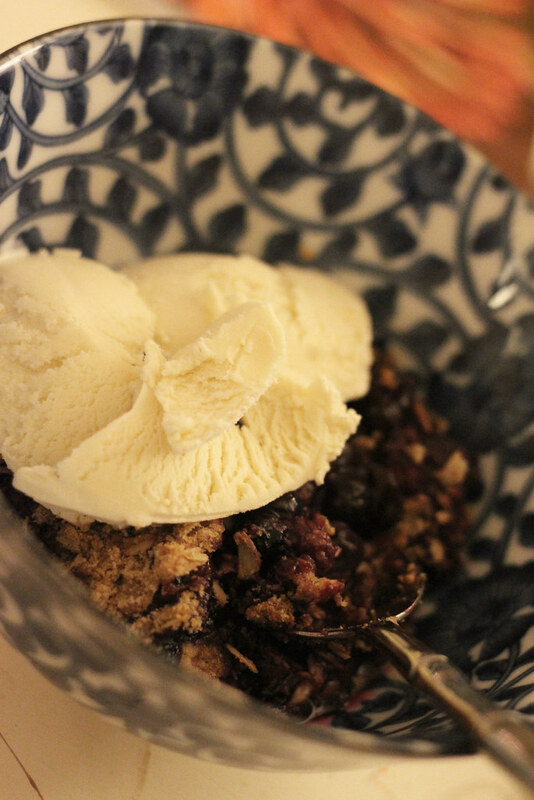 This berry crumble turned out perfectly crumbly with a hearty topping but wasn't super sweet - the berries really held their taste and the lemon and ginger kept the sugar from turning this into a too-sweet dessert. Below are the hyphenated steps in photo form and then the recipe. Preheat the oven to 375 degrees (and make sure you take out the old waffle that was in there from Sunday's brunch so that it doesn't smoke up the whole house... this step might just be for me). Your rack should be in the upper third of the oven. Toss your washed blueberries and blackberries in a large mixing bowl with sugar, lemon juice, chopped crystallized ginger, and 2 tsp. flour (from the original 2/3 c.). Turn the berries into the 9" pie plate. P.S. They're should be looking berry delicious at this stage. 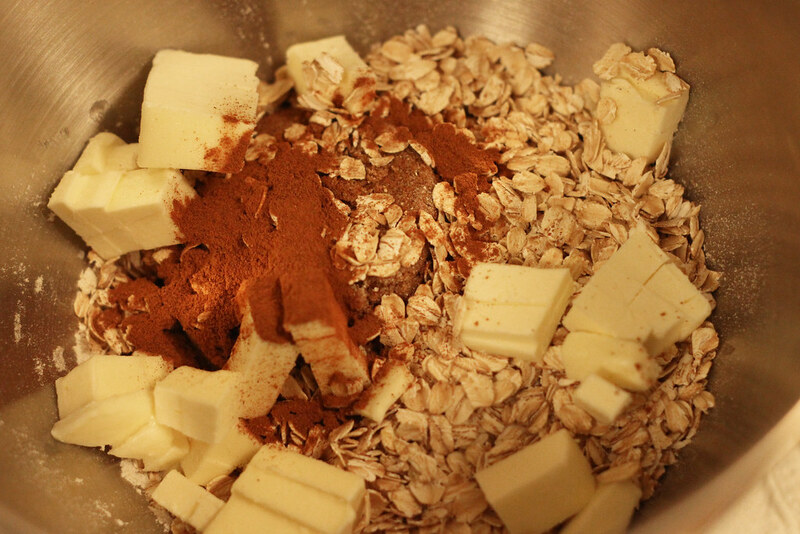 In a medium mixing bowl, mix the remaining flour, brown sugar, cinnamon, and oats. Then cut in the butter (cut into small pieces) with a pasty cutter until crumbly. 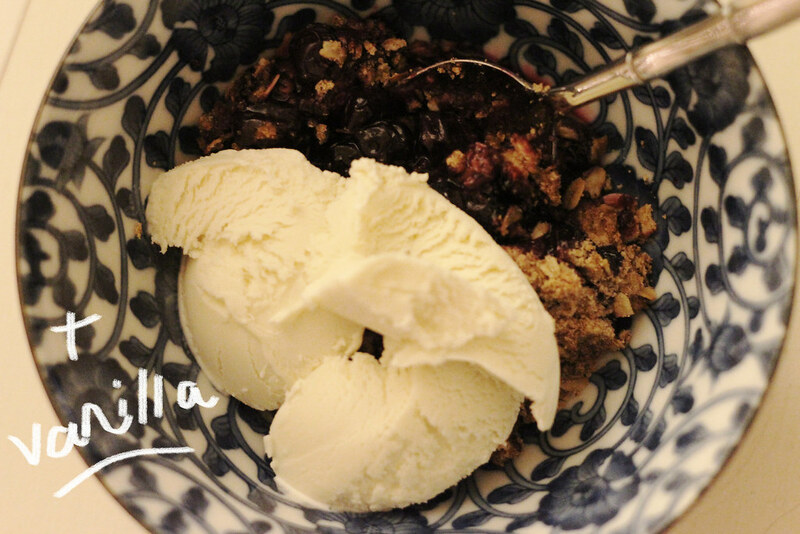 Sprinkle this topping over the berries. Depending on how much topping to berry ratio you like, you may want to reserve some of the topping as it makes quite a bit! 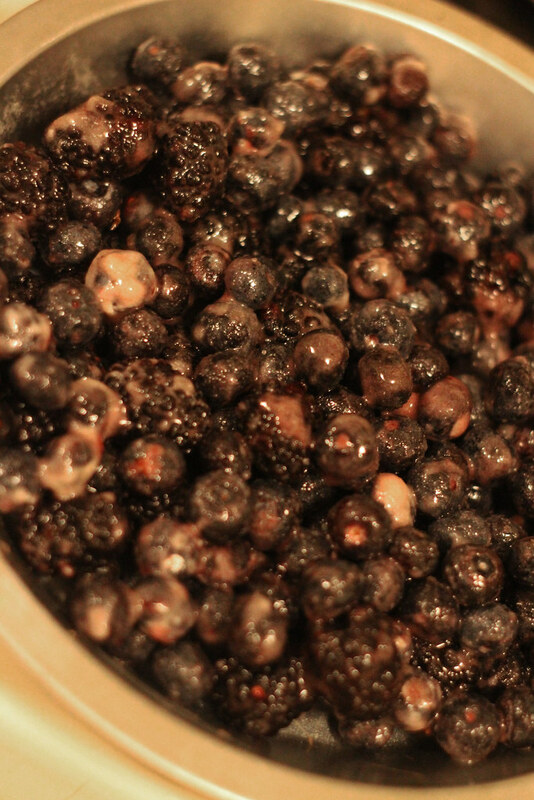 Bake for 35 minutes until the top is brown and the berries are bubbling up and over your pan. Serve it warm with vanilla ice cream (I prefer Haagen Dazs). I'm going to try this this week... even though I'm supposed to be on a diet. It looks so tasty! Omgsh, I am so drooling right now...this looks FANTASTIC! 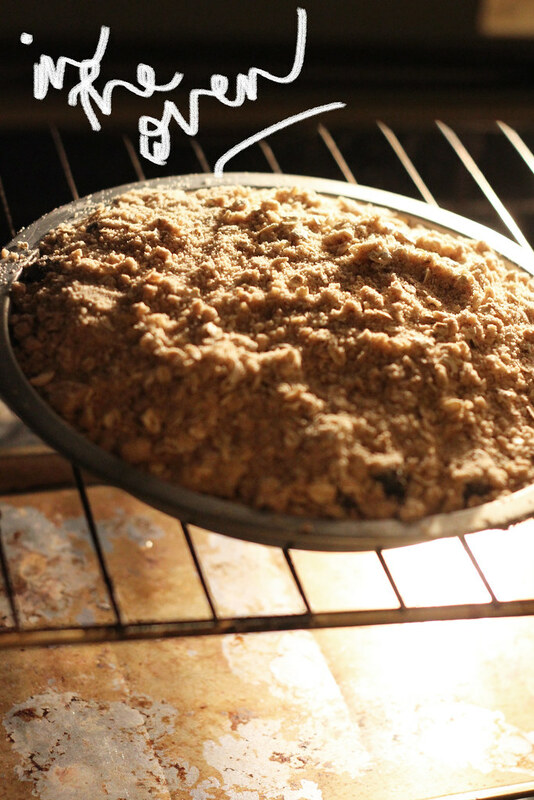 this seems fairly easy - although I never used oats for anything before - and incredibly delicious! 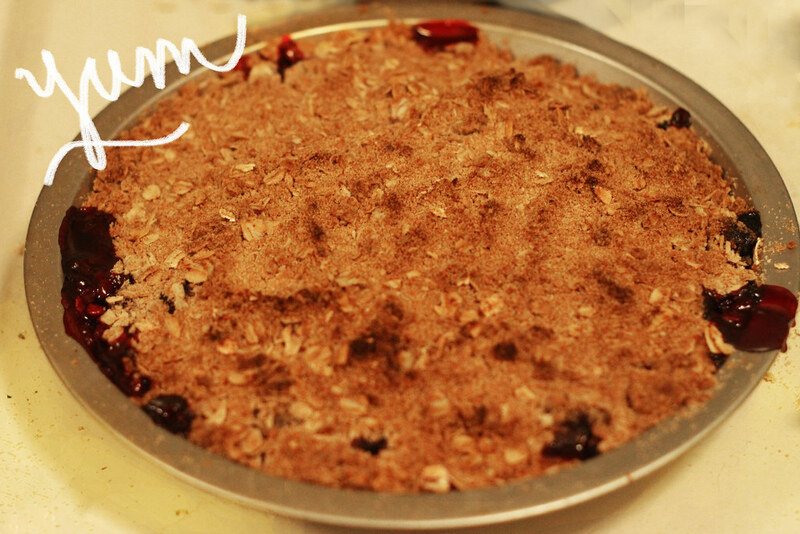 Ooh, I've got a berry crumble craving now. I must make this soon! Oh yes! I like how this sounds and looks! I need to make one asap. I would love to have a taste from this. This isn't cooking...it's baking at its finest and it looks amazing! Oh yum! This looks amazing I could eat this for breakfast and for midnight snacks! Geez, all your recipes look so yummy! I need to try pretty much everything you put up here haha! MMM seriously. I want this right now. 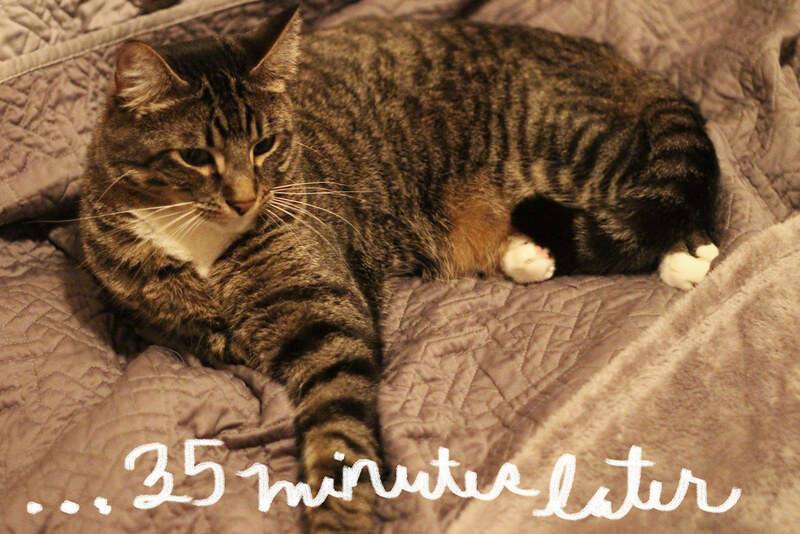 This looks so goo adn I have oatmeal at home.